Internal diameters vary to accommodate two different approaches to welding a port to a vessel. Model 100 (AF-100-60-L040) Has an inner diameter of 25 mm to allow immediate use after welding. Model 105 (AF-105-60-L040 Undersized) Has a slightly smaller i.d. 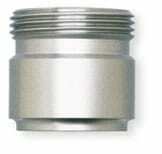 to allow the port to be honed out to the proper diameter after it has been attached to the vessel. This second approach is more forgiving of different welding techniques.